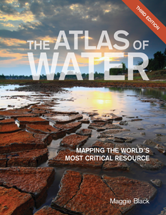 This vibrant atlas addresses all the pressing issues concerning water, from water shortages and excessive demand, to dams, pollution, and privatization, all considered in terms of the growing threat of an increasingly unpredictable climate. It also outlines critical tools for managing water, providing safe access to water, and preserving the future of the worlds water supply. 1 Global Water The volume of water in the world never changes, but only 2.5% is fresh, and more than two-thirds of this is unavailable for human use. 2 Water's Unequal Distribution The amount of water that falls as rain, filling lakes, rivers, streams and aquifers, remains constant. At present we are still using less than a third. 3 Water Shortage The spectre of water shortage is less a global phenomenon than one threatening particular regions and localities. 4 Rising Demand Around 4,000 cubic kilometres of fresh water are withdrawn every year -equivalent to roughly 1,700 litres per person per day. 5 Dwindling Supply About a fifth of water used comes from aquifers. Some are replenished, but many are non-renewable and are being irreversibly mined. 6 Competition and Conflict As populations grow, and more water is extracted per person, there is increasing competition and conflict over the exploitation of river waters and aquifers. 7 Environmental Security Aquatic ecosystems make a vital contribution to environmental security. 8 Ice and Snow Melt Climate change is likely to affect river flow in many complex ways. 9 Storms and Floods Life-threatening and destructive floods are becoming more frequent and affecting an increasing number of people. 10 Droughts The world's drylands will become drier as a result of climate change. 11 River Basin Stresses Seasonal changes in river flow and temperature of fresh water affect water quality. 12 Water for Drinking Everyone has access to a source of drinking water but in an increasingly crowded world most natural sources are contaminated. 13 Water for Food All food production depends on water, so water stress leads to stress on the global and family food basket. 14 Water for Sanitation Many lower-cost sanitation systems in the developing world use no water or very little. 15 Water in the City The increasing number of people living in towns and cities is exerting huge pressure on municipal infrastructure and services. 16 Water at Home There are huge discrepancies in the amount of water people use in their home, depending on lifestyle and availability. 17 Water and Disease Water's critical role in hygiene and sanitation, and in the spread of diarrhoeal disease, confers on it a central place in public health. 18 Water Footprint Industrialized lifestyles involve the consumption of large amounts of «virtual» water embedded in foodstuffs and in manufactured items. 19 Water for Irrigation Around two-thirds of water withdrawals are for irrigation, which supports a fifth of the world's cropland. 20 Water for Fisheries Tish make a major contribution to the global food supply and are increasingly farmed as a cash crop. 21 Water for Industry Just over 20 per cent of all freshwater withdrawals are for industry. 22 Water for Energy Water plays a vital role in the generation of electricity. 23 Transport and Leisure Water is integral to many productive and cultural activities not easily traceable in economic statistics. 24 Water for Sale The sale of water is an inevitable part of any organized delivery system, but in general the wealthy pay less than the poor. 25 Dammed Rivers Nearly 60 per cent of major rivers are impeded by large dams. 26 Dispossession by Water Rivers need to be managed so as to sustain the lives of those dependent on them. 27 Water Pollutants Globally 2 million tons of sewage, industrial and agricultural waste are discharged into the world's waterways every year. 28 Water Pollution Rapid urbanization and accelerating industrialization are causing increased water pollution and corresponding environmental threats. 29 Damaged Waterways Industrialization is damaging the world's waterways. 30 Threatened Ecologies Even subtle changes in quality temperature or seasonal availability of fresh water can have a devastating effect on the living organisms that inhabit it. 31 Technological Fixes Technological innovations and adaptations have a role in meeting the mounting threats to freshwater supplies. 32 The Rising Price of Water Water is a vital resource to which everyone has a right, but it is also seen as a commodity for which a realistic price should be paid. 33 Treaties and Obligations More than 260 river basins are shared between countries, and equitable use of their waters requires negotiation and agreement. 34 Striving for Co-operation The spectre of growing competition between states over water has generated fighting talk, especially in retaliation against upstream behaviour. 35 Managing the Future The real world water crisis is a crisis of water management.